Culver Resident and author John Houghton wrote a column in 1974-75 for the Culver Citizen, focusing on Culver History. With his kind permission, we reprint some of his writings from that series. Until the Great Depression (to choose an arbitrary date for the end of what must have been a long fading), tourism was Culver's principal business. The stream of visitors came to Culver on six daily trains and frequent excursion specials; once here, they stayed in a set of hotels with names worthy of Dylan Thomas. 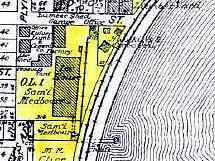 The Arlington, which gave its name to Culver's other railroad station; The Chadwick, which so dominated Long Point that the point was originally named for the hotel there (there were protests when the first map labeled Long Point was published); the Lakeside, Jungle, and Ralston's; Osborn's, the Bide-a-Wee, and the Palmer House -- or in the many cottages which crowded around the lake. Of the two groups (the occasional visitors and the regular returning summer people), it was the regulars, the cottagers, who made the greatest mark. These people were a varied lot: they built small, practical houses, like those south of Long Point, and such fanciful demi-mansions as the famous House of a Thousand Candles; politicians and writers, railroad tycoons (the managers of the Vandalia Railroad even had lake water shipped to their winter homes, when they had to be away from Culver) and shopkeepers, they came from St. Louis and Chicago, Rochester and Madison (the Laniers had a home on Maxinkuckee). The best of them had a sense of responsibility to their summer community. Most important of those responsible people was certainly the man who gave the town his name. Henry Harrison Culver was born in Madison County, Ohio, in 1840, and left home for St. Louis, with his brother, at the age of 15; some months after they arrived in Missouri, they took jobs as traveling salesmen for a cast-iron stove manufactured by the McReary brothers of Springfield, Illinois. 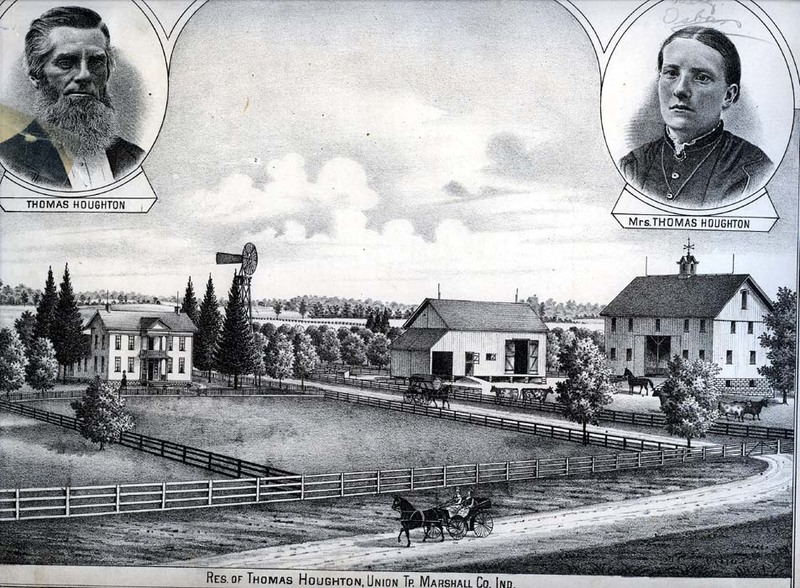 As might be expected, this salesman eventually met a farmer's daughter, and he and Miss Emily Jane Hand were wed in 1864 at their home, about eight miles east of Lake Maxinkuckee. "I spent the whole summer by the side of the lake...when fall came, I was a different man. It had such a glorious effect on my health that I determined to acquire property here. I bought 98 acres on the Northeast corner of the lake. The following year, I bought 208 acres...in 1888 I built a tabernacle, a hotel, and some cottages, and arranged to have a big series of religious meetings...I had revival meetings and lectures for the whole of that summer..."
Even after he abandoned this experiment in public enlightenment, Mr. Culver didn't keep all his land for his own purposes: forty acres were cleared, a track was laid out, a grandstand erected, and the whole facility was then turned over to the public for a fairground (interest eventually waned, and the property returned to the Culver estate). "Walker spent his youth sailing with the other young fry around the lake. He loved the lake so much that he wanted to spend his honeymoon there in 1913...His mother did not think it a proper place for a bride. There was no running water, oil lamps were used, the beds had shuck mattresses, and our clothes were hung on nails on the wall. 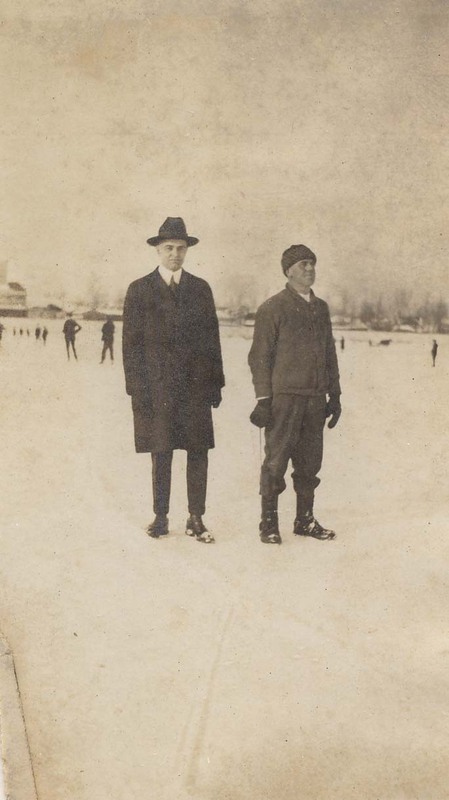 "In 1931, Walker wanted to recapture the sailing on the lake and at a dinner, at the Culver Inn, he invited the East Shore residents to help him. Then was founded the Maxinkuckee Yacht Club. The boats being sailed then were in Class C and Class E. The Academy had one large Class A boat (Ed. Note: It still does: I remember that the A scow was on the lake in the summer of `67 while I was in Naval School; my platoon leader and the girl's school crew capsized it). Colonel Miller from the Academy became the judge, and each Sunday morning the sailors scrubbed their boats and tried for the cups presented. I think that almost as important as the golf course and the yacht club among the contributions of the summer people was the example of enjoying the lake as something more than a source of water and ice; it's usually true that it takes an out of towner to recognize the true advantages of a place, and Culver is no exception. Before beginning the substance of this column, I should pause to warn historians and journalists that these writings are neither "fish nor fowl nor good red herring." I'm no newspaperman, to begin with, and my intention, in any case, is to report in this space not history, but stories about Culver as people tell them to me. I won't let facts interfere with a good story. 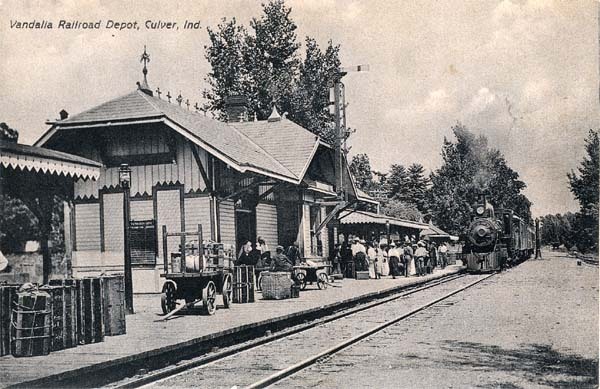 Culver almost didn't have a railroad. 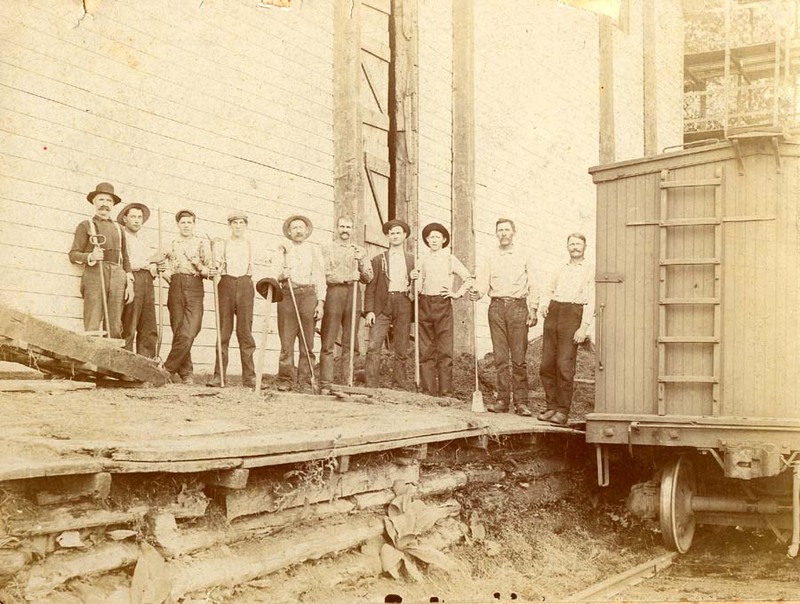 In 1883, the Vandalia Railroad company planned to extend its trackage to South Bend, by way of Walkerton. The present route was adopted because the citizens of Center Township voted a $30,000 subsidy for the railroad and because eight Plymouth men who owned lake property in Culver agreed to give the railroad a right of way through their land. Track was complete to Plymouth in 1884, so Culver must have seen its first train about that time. 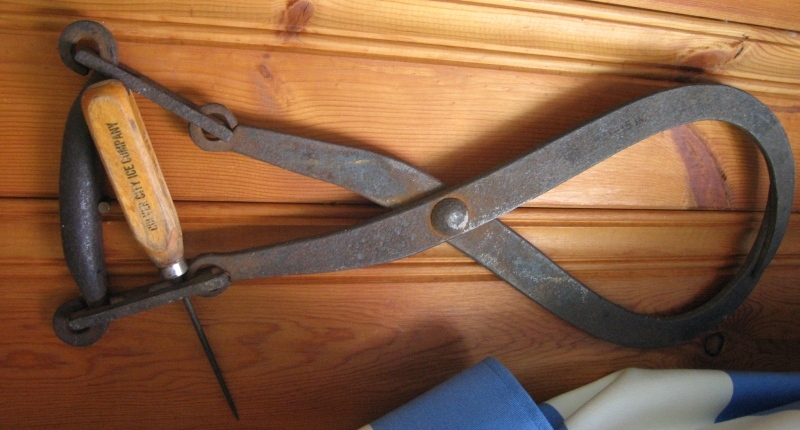 I've always felt a certain curiosity about abandoned things, wondering what old tools were used for, or who lived in houses long since deserted. Walking along the railroad always stirs up this curiosity in me, and I have, in this way, found out about the Arlington station, and the turntable, and even a canal cut under the railway to serve as an ice-house. I think these bits of knowledge made me a little cocky, for when Bob Kyle recently mentioned to me that a tavern once stood near the Culver railroad station, I immediately concluded that this tavern was the answer to one of my pet questions: what was the spur of track west of the station used for? Even as Mr. Kyle described the Kreutzberger establishment, I began to picture that short piece of track filled by two brightly colored boxcars full of beer, waiting to be unloaded by eager customers of the saloon. This made such a good story, in fact, that I had provided it with several embellishments before my great uncle, Lester Houghton, told me that my track actually served as a baggage depot, in the days when all of the present station was needed to accommodate Culver's heavy tourist trade. I was crushed at the loss of such a fine story as mine had become, but I did, at least, salvage from the wreckage an idea for my next column: I Remember...the Out-of-Towners. See you then. This column is intended to provide a quiz with something for everyone: there are some easy questions at the beginning, whose answers I have put at the end of this space; then there are some questions whose answers I don't know. These latter questions are the real CONTEST; I invite anyone who knows the answer to one or more of them to jot, the answer down and send it to me at THE CITIZEN (neatness isn't important): I'll print the names of the earliest and most thorough answers in my June column. 1) Where was "the old Methodist church"? 2) What prominent local family (whose name is the same as that of a spring holiday) lived next door to that church? 3) One of the town's smaller church buildings either is, or is built on the site of (I'm not sure which) the town's first jail. Which church is it? 4) Is the Osborn Block North, South, East, or West of Osborn Square? 5) A photography studio "opposite the post office was operated by a set of brothers." What was their name? 6) What street was the Post Office on in those days? 7) There was, not so long ago, a doctor's office upstairs from what is now Verl's barber shop. Who was the doctor? 8) Where did that doctor move his practice after he left the office described in (7)? 9) In the days of ice-boxes and home delivery, was milk brought to your door in the early morning or later in the day in the winter-time: that is, in December, could you wake up bright and early and find a bottle of milk waiting for you on the front step? 10) The green pavilions in the park — those shelters at either end with picnic tables under them — were originally used for something else. What? 11) What is the oldest house still standing in town ? 12) What were the names of the two boats whose partly burned hulls used to be seen in the lake near the outlet? 13) There used to he a restaurant where Kline's TV and Appliance store now is...Who started the restaurant? 14) Ruhnow's heating supply business is now located in building which once held a blacksmith's shop, I think: the doorways and windows are shaped like horseshoes. Was this really a blacksmith's? Who was the smith? When did he go out of business? 15) When did the last passenger train come to Culver? 16) Who was the first school teacher in Culver? 17) Why do so many of the streets at the south end of the town have Spanish names (Obispo, Batabano, Prado)? 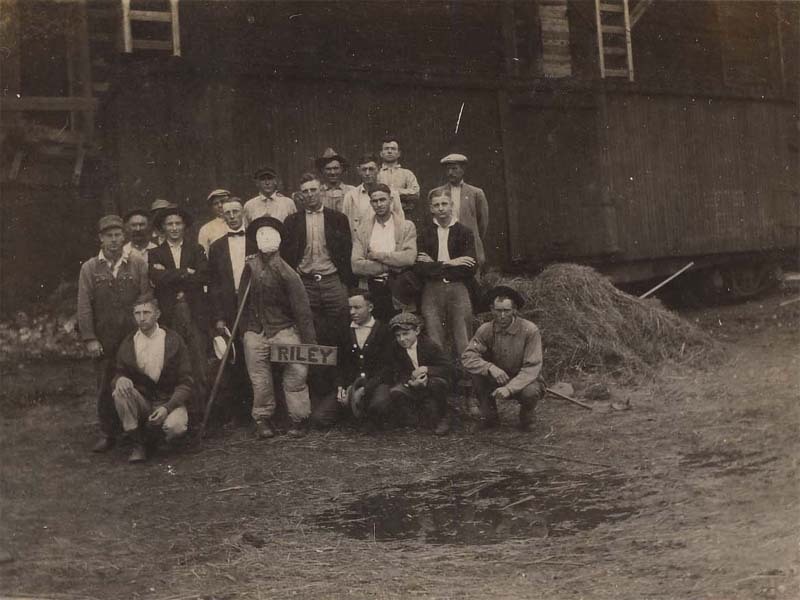 18) Was there a celebration of Culver's centennial in 1936? If so, what went on? 19) How many flowing wells and springs are there around the edge of Lake Maxinkuckee? Where are they? 20) What was the biggest fish ever caught in the lake? Who caught it? Well, those questions should keep everyone busy for at least a month; remember, if you have even a guess at an answer, leave a note for me about it at THE CITIZEN. 1) Where the N.IP.S.Co. office is now, just North of the Library. 2) The Easterdays 3) The Rollins chapel, on Coolidge St. 4) South: it makes up most of the West side of the-first block of South Main Street. 5) The Keen Brothers 6) Main Street 7) Doctor Howard 8) The Lake Shore Clinic 9) Milk was delivered later in the day in the winter, so that there would be someone awake in the house to take it inside before it had a chance to freeze. 10) They were, or else they are copies of, the shelters over the passenger loading platforms at the Train station. I have received some answers to the questions I asked in my last column, including a letter from Mrs. Floyd Deck, my great-aunt Zelta. With a few comments (all in parentheses), I reprint here Aunt Zelta's letter. "Here, I hope, are a few answers to your "A Quiz on Culver," beginning with the one about the oldest house in town. There are several houses which I can remember as being quite old when I was a kid. One is at 452 South Main Street, the home of Charles Riccardi; my great aunt, Elizabeth Duddleson, lived there for many years and was a teacher in Culver's school: that addition to Culver is named Duddleson's Addition for her and her parents. Another old house is at the north end of Harding Court: people used to call in the "Lord's Property," and I think, John, that your grandparents used to live there (note: Mark Roeder's History of Culver makes mention of the house here). "I'm not sure about both of the sunken boats you asked about in question 12, but one of them was the "Aubenaubee." "You're right in guessing that Ruhnow's shop was once a blacksmith's. Walter Fishburn and his brother Arthur had a smithy there for many years; this was where my father, Zina Duddleson, took our horses when they needed new shoes. I can remember watching them shoe the horses here as we walked to and from school. 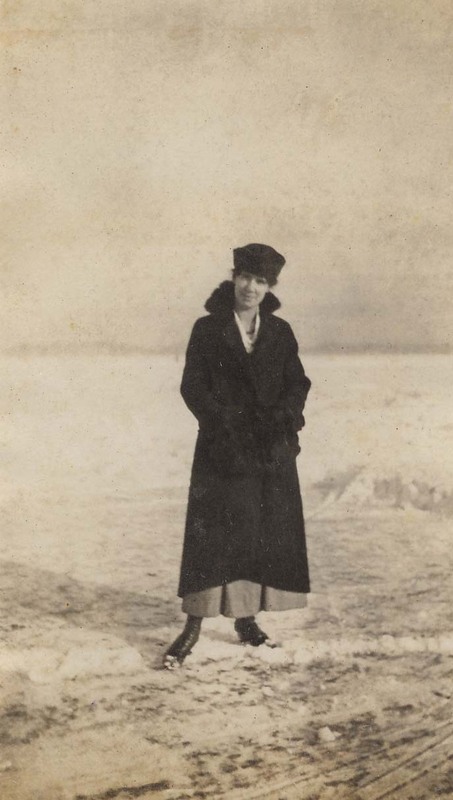 "I think my great-aunt Elizabeth may be the person you were looking for when you asked about Culver's first school teacher: she was certainly one the first "school-marms" in the township. Your answer to number seven was true, but it wasn't the whole story. Dr. Mackey's office was "above what's now the Kelly Shop (not Verl's barber shop -- there was a barber shop over the undertaker's there)" over 50 years ago: he later moved to the house just east of where Mrs. Jerome Zechiel lives, long before Culver ever heard of Doctor Howard (I've also been told Dr. Powers started out here -- Ed). "While you were searching for people and things of long ago, I wonder if anyone has ever heard of Liona A. Dean. When we tore down the old house, we found that a tombstone with that name on it was supporting the south-east corner of the building. We now have the stone in our rock wall along the east side of our yard." Besides the things aunt Zelta has mentioned, I should mention that I've been told that the Keen brothers moved their photography studio from Main Street to Lake Shore Drive. *Note: that building, in 1974, would have been just south of Verl's barber shop on Main Street. The building was torn down and at present (2005) is still a vacant lot. **Note: There is also apparently more to this story. 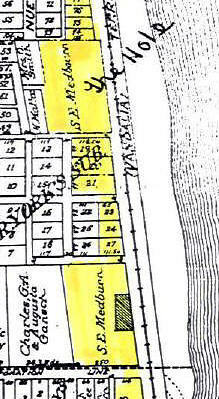 That area of Culver, on the south end, was once the Chautauqua Assembly, est. 1899, 26 acres located on the south end of Culver, in what is today the area cut with streets like Nueva Gorda. According to Mark A. Roeder's "History of Culver & Lake Maxinkuckee," the "Maxinkuckee Assembly of the Christian Church," its official name, was quite elaborate and had many refined educational opportunities. A picture of the Assembly can be seen here. My roommate, Parker. who proofreads these articles for me. has pointed out that there has been, in the series, a certain oscillation between the general and the particular (well, to be honest, he says. that 1 must make up half the columns out of thin air the night before they're due in the mail). If my readers have noticed this same problem (and I suppose they have -- Parker's not too quick on the uptake these days, having hit twenty-one this last summer). I must apologize, offering as an excuse the fact that it has turned out to be harder than I had imagined it would be to write a column of local history a thousand miles away from the locale in question. Bear with me, folks, and things will pick up when I get home in June -- prosperity is just around the corner, as someone once said. How old will Culver be in 1975? -It's not a particularly important question, I suppose, but it comes to mind because of a newspaper clipping (from the Citizen, of course) which I've just found tucked into the back of my copy of McDonald's HISTORY OF MARSHALL COUNTY (alright, Parker, so this is where I get my ideas -- wanna make something of it?). More about the clippings in a minute, but first in this search for beginnings I should talk about the early settlers of Union Township --the first white people to live on the site of Culver. The settlers came up to old Michigan Road in the early summer of 1836, approaching Culver from the east along (more or less) the modern State Road 10 (in fact, there is a small stone at the corner of Road 10 and the county road just east of Fleet Field which commemorates the arrival of the doughty band). If this event is taken as the beginning, Culver is now 139 years old. But we can hardly let the matter rest at that. The first record I have found of a real village on this site is that newspaper clipping from June, 1969 CITIZEN. It shows a very surprising 1844 map: Lake Maxineukkee (as they spelled it then) is easy to find, and on its northern shore is the hamlet of "Geneva." That would make us 132 years old, but, as I have said, the map is surprising: the first official record of our town is dated 1844 and refers to "Union Town," Bayless L. Dickson, Proprietor. McDonald makes no mention of Geneva, and I still have no idea where the map marker got the name. 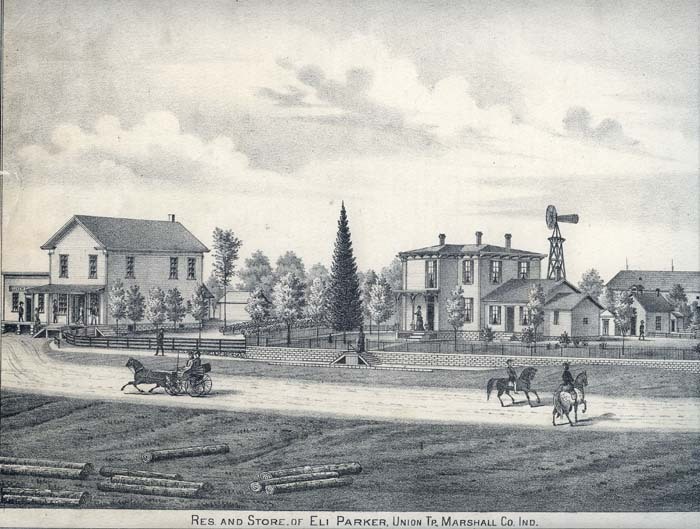 The 1844 plat, which advertises: "Union Town is laid out in such a manner that it presents to the eye a view of Lake Maxinkuckee, and is surrounded with as good a country as can be, found in northern Indiana," would leave Culver with only 131 years. At some point in the fifty years after the first plat was filed, the name of the village was changed to Marmont, in honor of a a local citizen. In 1894. the village was incorporated, and so Culver had its legal beginning, eighty-one years ago. And then in 1896, the name was changed again. Ninety-nine people (ninety-nine men, things being what they were in those days), as a majority of the voters, petitioned the Town Board to replace "Marmont" with "Culver City." The Board, like Barkus, was willing, but the U.S. Post Office was not. It seems that there was already a Culver, Indiana and the addition of "City" to our town's name didn't make any difference. Henry Harrision Culver, who found himself at the center of the whole affair, went off to the other Culver to see what could be done. He discovered that the town was named for Crane Culver, and, the citizens weren't about to let his name be forgotten. But Henry Harrision was nothing if not imaginative, and soon rose to the situation. He offered to meet all the expenses involved if the other town's name were to be changed to "Crane." 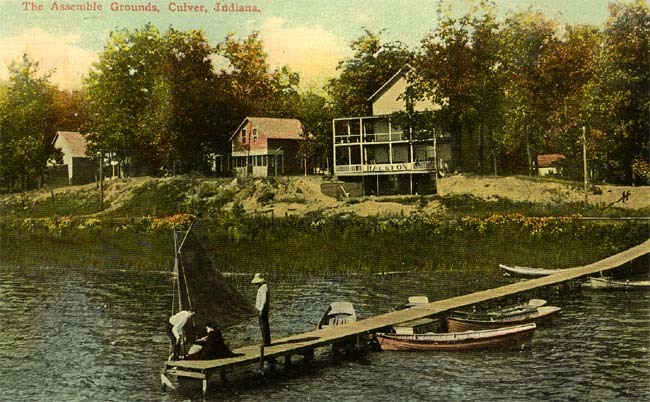 The deal went through, the Post Office agreed, and Culver, Indiana, on beautiful Lake Maxinkuckee, had finally begun—79 years ago. Well. there you have it: 139, 132,131. 81 or 79, Culver can take its pick of ages. But this column is intended to display a prejudice favoring people over institutions, so I must point out, before closing, that our Culver is as old as its oldest citizen and as young as its newest arrival-it has its beginnings not only in all the other Culvers, Marmonts, Union Towns and Genevas there have been, but also on every place in which any of us have ever lived. And that's what makes it interesting. tenn' annkennuvar. Stories passed down in the families of its earliest settlers declare that the arrival of Culver's founding mothers and fathers in July of 1836 was marked by the sounding of a conch shell, as a signal to those who had acted as harbingers for the main party. At twilight of a hot summer day, on the highlands east of the lake already named Maxinkuckee, the ox-drawn wagons that had plodded north along the Michigan Road from Rush County were finally drawn to a halt, and the British immigrants, driven to this frontier by an international depression,- staked their claim to the land of the Indians, Jesuits, and coureurs du bois by blowing a sea-shell horn. At least one earlier settlement had been planned for the area, but the first village to meet with any success on the shores, of Lake Maxinkuckee called Union Town when it waylaid out by its proprietor Bayless-Dickson, in 1844; Its setting at the north side of the large glacial lake, within two miles of the camp site of '36, made the village at once pleasant to live in and convenient to the various farming families for whom it served as a trading center. 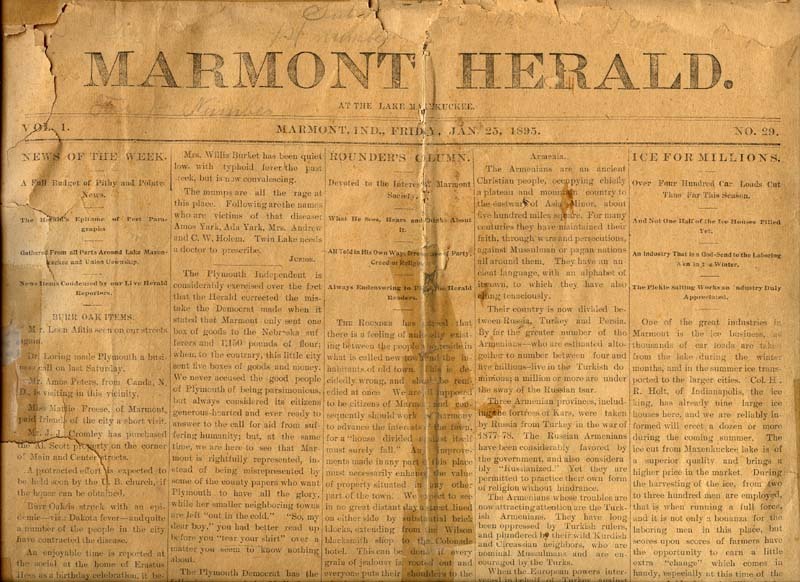 The village grew, and (after passing from the Dicksons to their cousins the Houghtons) eventually left proprietary status altogether; in 1851, the name of the development was changed to Marmont, to honor a Marshal of France who had deserted Napoleon to support the Bourbons. During that time, the lake Began to attract to the area its second major constituency, the vacationers. At first, these were merely residents of Plymouth, the county seat, who had benefitted sufficiently from the county's growth to be able to afford a summer home miles away on the high eastern banks of the Indians, "lake of sparkling water.'' As transportation became easier with the completion of the Vandalia Railroad in 1883, the summer settlements increased. 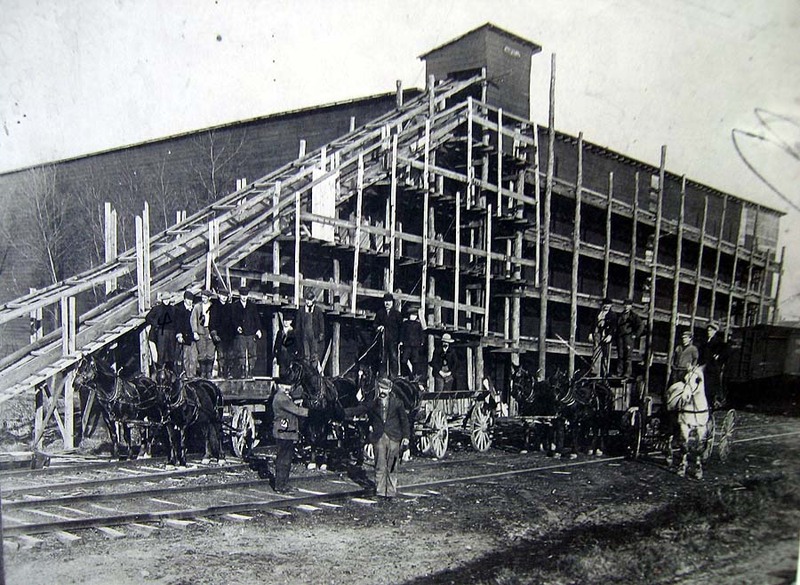 As hotels were opened, the first commercially successful steamboats appeared on the lake. This pleasant farming town with its collection of outlying summer colonies spread out on the west, north and east shores of the take. It had particular appeal to one St. Louis businessman who, while traveling as a stove salesman early in his life, had married a farmer's daughter from the east side of Maxinkuckee. So when Henry Harrison Culver's poor health required him to quit active management of the Wrought Iron Range Company, he returned to the area where his wife, Emily Jane Hand, had grown up and begun to devote himself to charitable projects. 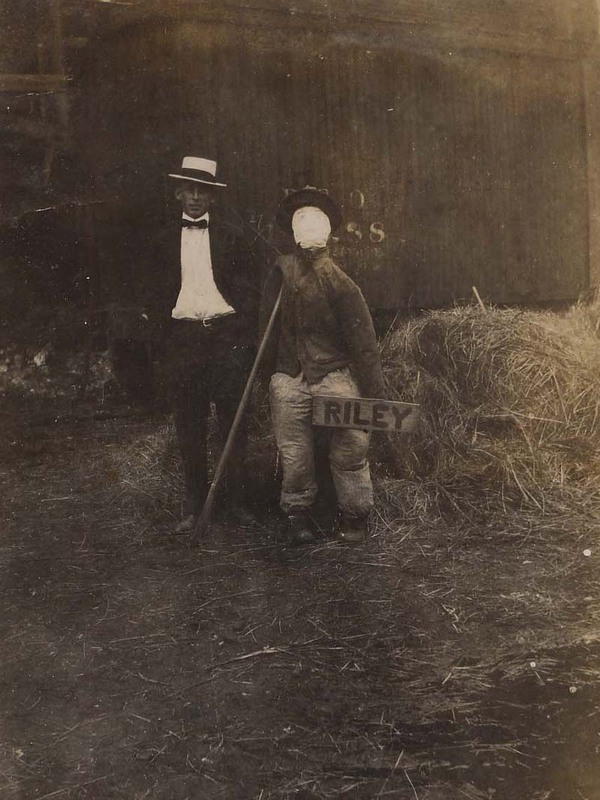 His efforts to begin a county fairground were unsuccessful, and when the Chatauqua movement did catch on in the area, it was years later, and on the other side of the lake from the property on which Mr. Culver had introduced the idea. Finally, Mr. Culver decided to turn his hand to education, and he founded the Culver Military Institute (later Academy) in July of 1894. Within a year, the school burned to the ground, but Mr. Culver rebuilt it with fireproof brick, steel and stone. It was at this point that he remarked about the lake that had so attracted him, "While fishing one day I caught a fine seven-pound bass, and sir, that bass has cost me $250,000." His determined philanthropy won the admiration of the town's residents and, in 1895, at the petition of 100 voters, Marmont changed its name to Culver City (Mr. Culver smoothed the way by arranging for an earlier Culver, Indiana, to change its name to Crane; later, the Post Office asked that "city" be dropped, and the town has been simply Culver ever since). By the time of Mr. Culver's death in 1897, his school, which had combined with (Confederate) Colonel A. F. Fleet's fire-ravaged Missouri Military Academy, was on a steady course that has since led it to become, as The Culver Educational Foundation, one of the nation's premiere preparatory schools. In the 86 years since Henry Harrison Culver's death, the town that named itself after him has changed in many outward appearances. 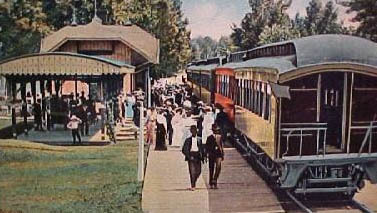 The tourist industry reached some sort of peak in tens and twenties, when the railroad ran six trains a day to Maxinkuckee In the season, and writers of the "Hoosier Renaissance" summered in the area. Improved transportation since then has meant that the lake population has returned to its original nature as a summer colony. The Town Park on the north shore of the lake is still one of the best swimming sites on the Iake and the crowds there in the summer show that the idea of an afternoon at Maxinkuckee has, with its clear spring water and tree-lined shores, power to attract people even today. Various small industries of the past have been lost through time -- the refrigerator, for example, has more or less obviated the former ice-harvesting industry -- but new ones have been gained, particularly a branch of the McGill Corporation, manufacturing bearings in an Industrial park on the west side of town. The various trades and businesses, which were the town's original reason for being, can still be found along Main Street, though they have reached northward since those days and now line Lake Shore Drive and State Road 10. East of Lake Shore Drive is the vast campus of the Educational Foundation; near Fleet Field, its private airport, where student pilots' take-off and landing patterns bring low flying planes over the ancient council sites of the Potawattomi Indians, there still stands a stone marking the place where the weary families of 1836 camped and blew their conch-shell horn. What is it that was harvested from fields, but never planted? Was found only in winter, but used mostly in summer? Was stored at Culver, but used across the country? Well, I'm not very good at asking riddles, because I always tell the answer right away. In this case, it's "ice. 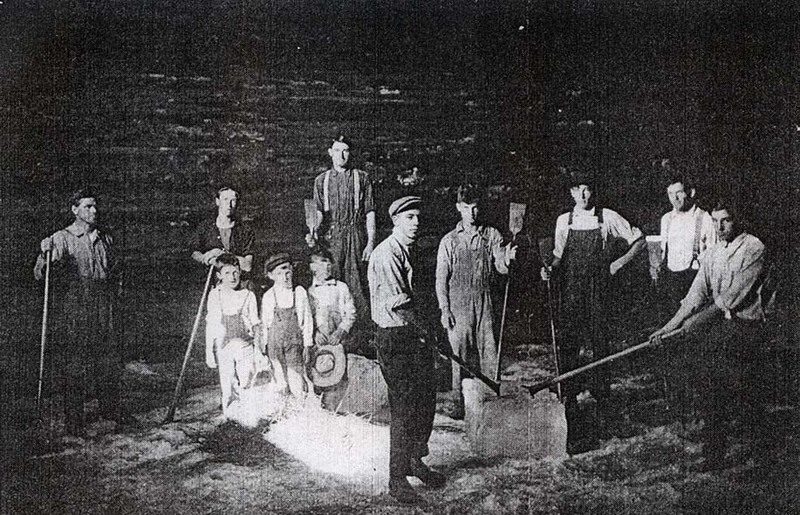 "Last September, before I left for school, I talked to Bill Easterday, Bess Easterday and Sam Medbourn about the ice business in Culver. This article is a summary of what they told me. The ice trade had its modest beginning when a man named Holt built an ice house (that is, a place to store ice after it had been harvested) on the west shore of the lake, north of the outlet. The Easterdays' father helped in this construction project by digging out the site with a horse-drawn scraper (this was-a thing like the shovel of a bulldozer, attached to some rigging so that the horse could pull it across the ground, scraping up dirt as it went). 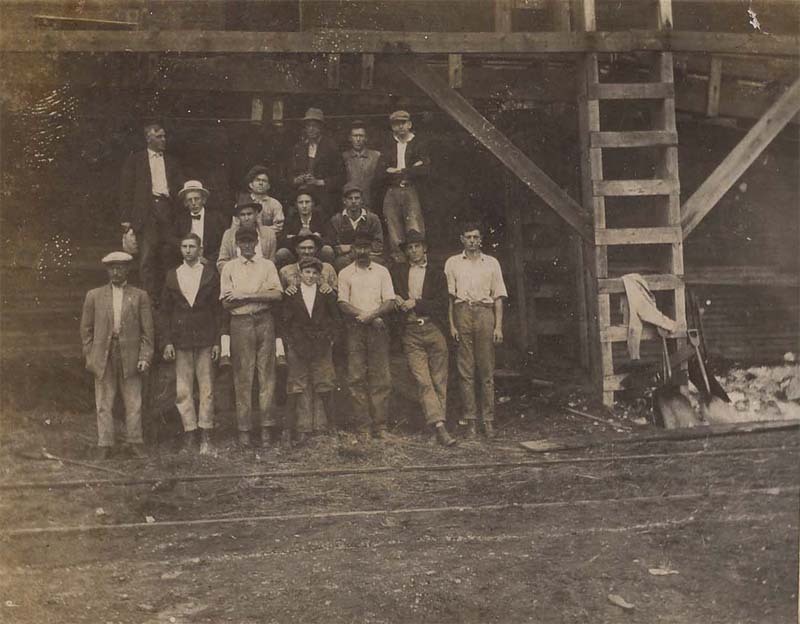 The manager of Holt's ice house was Samuel E. Medbourn, and it was he who developed the ice business into a successful industry. But before I can tell you what Medbourn did, I should describe the way in which the ice was harvested. The source of the ice, as may or may not be obvious, was the lake, which each year conveniently produces a new crop of the chilly stuff. 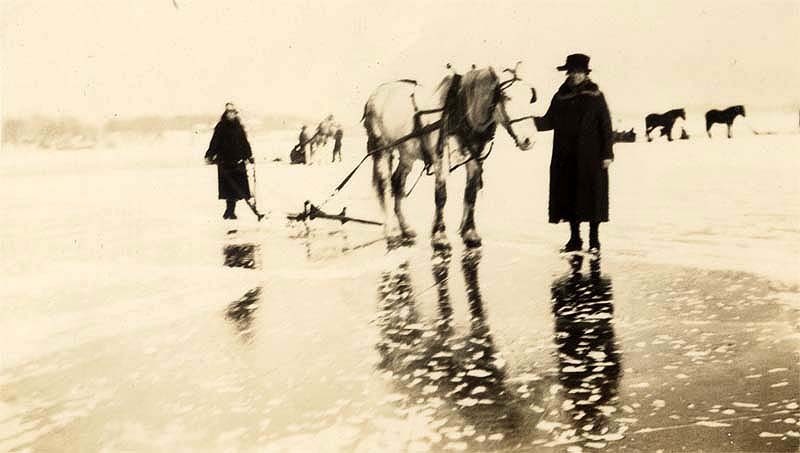 When the ice was thick enough to support the men and horses involved (at least nine -inches) the harvesting could begin. 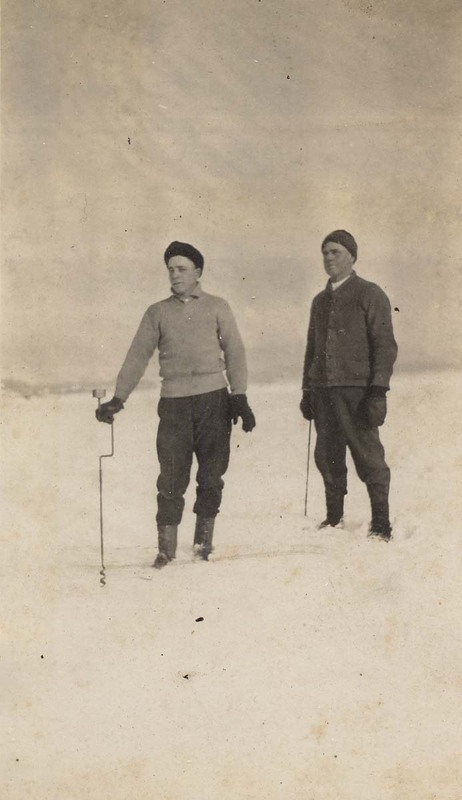 A channel about two feet wide was cut in the ice, working out from a point on the shore closest to the ice house. This channel increased, to three or four times its original width after it was a few yards long; farther out still, the channel was widened again. At this point, the first field was cut. Each additional field was cut away from one edge of an earlier field. 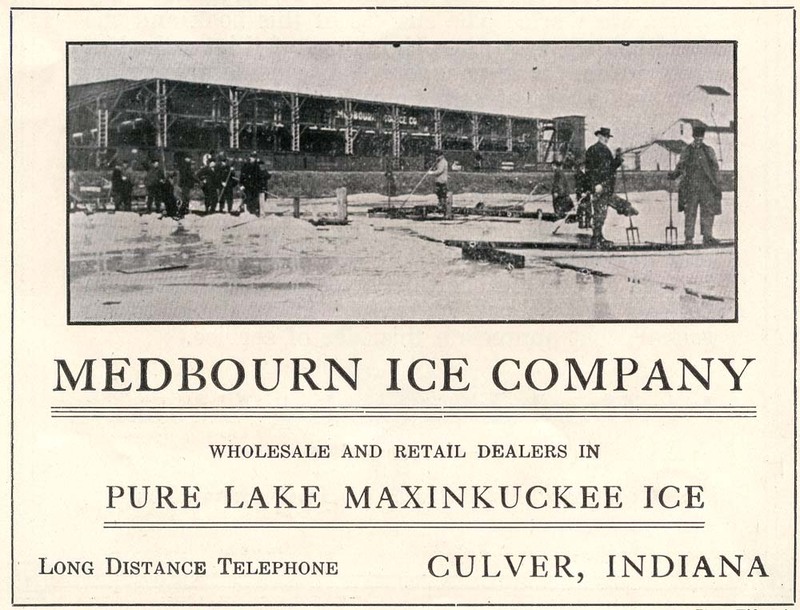 Left: A 1922 advertisement for Medbourn's Ice Company, from a Maxinkuckee yearbook. 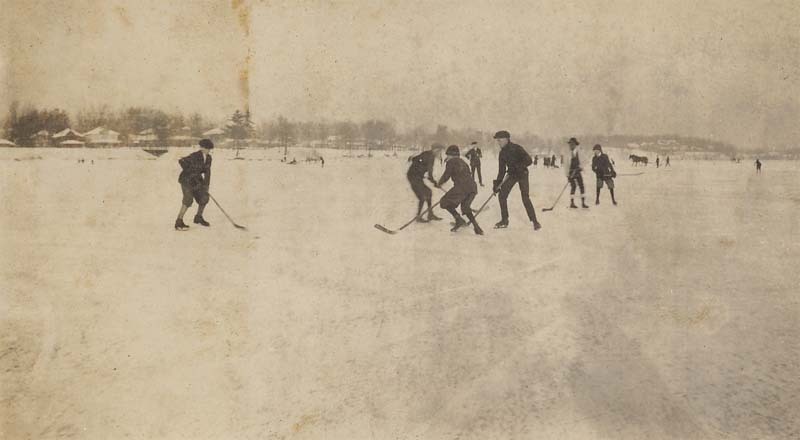 The ice to be cut was first scored by an ice plow, a set of spikes a little bit like a harrow, which left grooves about a foot and a half apart behind them as they were pulled across the ice by a horse. The plows were taken back and forth in the same grooves until the ice was more than half cut through. This scoring was done in perpendicular directions, so that a checker board pattern was made, with each square one and a half feet on a side. Each of these squares would become a one hundred and twenty pound block of ice. Every now and then, one of the horses used is this operation fell into the lake, but to the best of Medbourn's recollection, none of them drowned. To save a horse from drowning, it turns out. You throw a noose around its neck and tighten the noose until the animal stops struggling. You can then use ropes and planks to pull the unconscious horse out of the water, being careful, of course, not to choke the beast for any longer than is absolutely necessary. 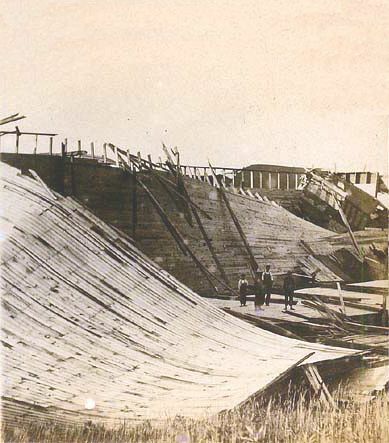 After a considerable area of ice (called a field) had been scored, large pieces (containing as many squares as could be managed at once) were broken loose along the scored lines with saws and pike-poles. 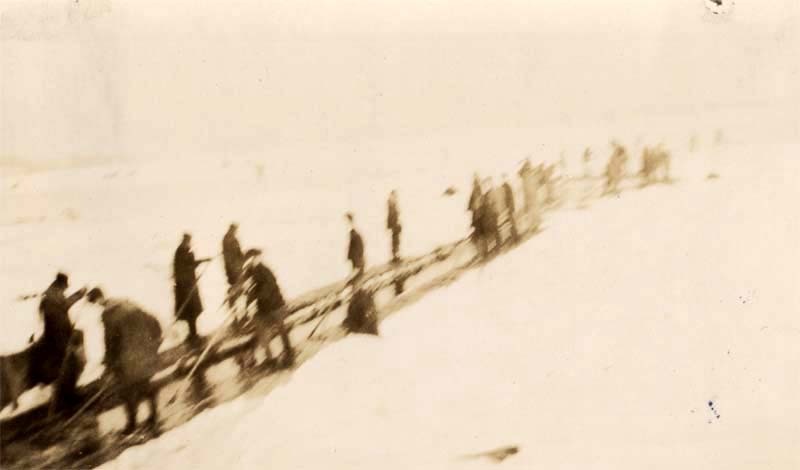 These large chunks were then pushed up the channel towards the shore; men standing on planks put over the channel like bridges at each of the narrowing points, used pike-poles again to break the ice into sets of squares small enough to fit into the next part of the channel. The last of these men produced pieces one square wide and several squares long, which were shoved on in to shore. This is where Samuel E. Medbourn's great contribution was made. Holt's ice house was cut off from the lake by the railroad tracks (as any building between the outlet and Jefferson St. would be). This meant that the ice had to be carried over the tracks. 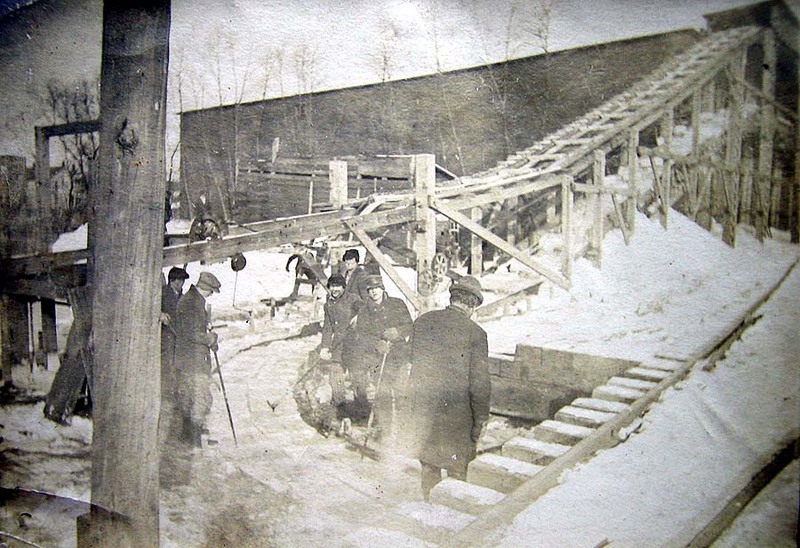 In Holt's system, the ice was broken into blocks at the water's edge, and there loaded on a conveyor belt which carried it over the railroad to the ice house, down to the lakeshore. This meant that work had to be halted and the tracks cleared of fallen ice every time a train was due. Now at that time, a drainage ditch ran down Madison St. through what was then a swamp behind the present sites of the Park and Shop parking lot and the Farm Bureau Co-op. It continued under the railroad tracks and down to the lake shore. Medbourn realized that no efficient harvesting could be done as long as the work had to stop for trains, and he saw that this opening under the railroad was just what he needed. He bought up the swamp, built an ice house on it and used the ditch (along with his natural talent for business) to such advantage that he was soon able to buy out the competition and become the proprietor of both of Culver's ice houses. After the Medbourn Ice Company became a prosperous enterprise, cement channels were built to lead from the house, under the railroad, to the lake at each of the sites, and these channels can still be seen today. In the Medbourn system (and hereafter I'll be talking about the ice house in the swamp unless I say otherwise) the ice was brought into the cement channel where it was broken into blocks 18 inches square and nine inches thick. These blocks were then pushed on the conveyor. 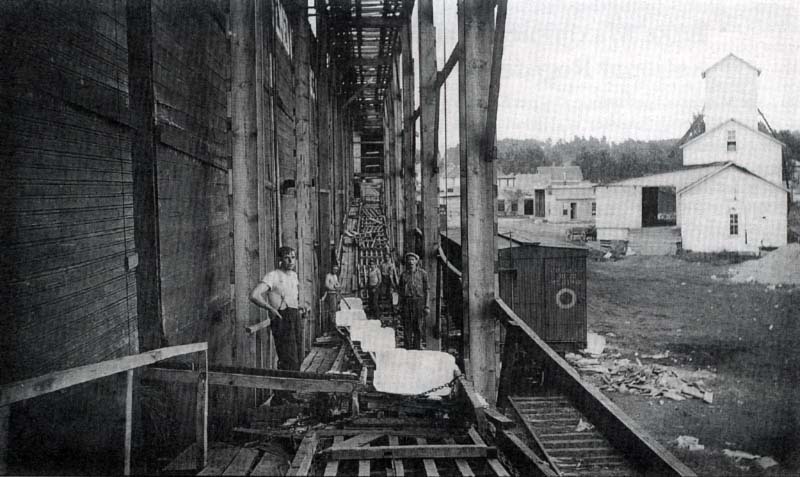 This conveyor was a 1200 foot-long belt of iron links with oak four-by-fours fastened across it at regular intervals. It weighed several tons, and ran from the channel directly past the front of the ice house to a separate building containing the steam engine which powered it. From the engine building it returned to the channel. The ice house itself was just four walls divided by partitions into eight rooms, each 120 feet long and 80 feet wide. The front of each room had openings at several levels from top to bottom. Each of the walls and partitions had 18 inches of sawdust for insulation. There was neither a roof nor a floor. The first layer of ice lay on the ground; the top layer was covered with marsh hay. Yet only the outside four or five inches of each of these layers melted during storage. 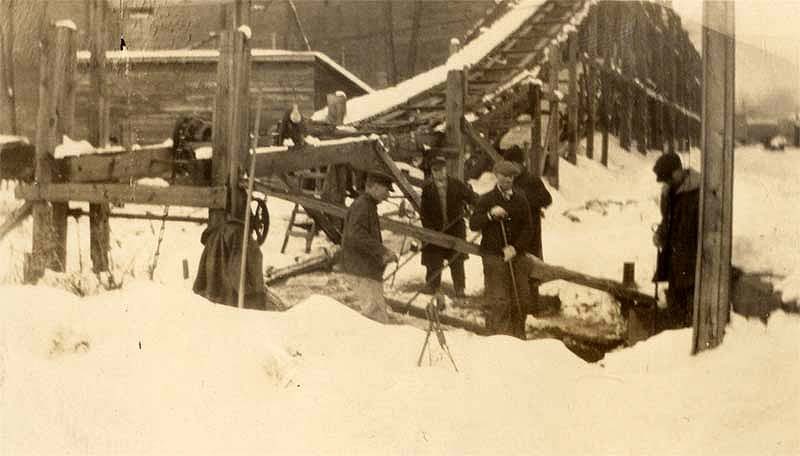 One of the greatest industries in Marmont is the Ice Business, as thousand of car loads are taken from the lake during the winter months, and in the summer ice tansported to the larger cities. Col. S. R. Holt, of Indianapolis, the "ice king", has already nine large ice houses here and were are reliably informed, will erect a dozen or more during the summer. The Ice cut form Maxinkuckke Lake is of superior quality and brings a higher price in the market. During the harvesting of the ice from two tp three hundred men are employed, that is when running a full force, and it is not only a bonanza for the laboring men in this place, but scores of famers have the oppertunity to easn a little extra "change" which comes in handy, especially at this time of the year, aside from the filling of the houses that belong to the company, there are a score or more private houses that are filled. Which employ a large force of men. The business of the Holt Ice Company at this time is managed by Sam Medbourn who throughly understands the manipulating everything to direct interest of the company. From $1.00 to $1.50 per day is paid to the men, and when we say about $15,000 is left here every year, the outside world can readily see the magnitude of this mamouth industry, and when the other houses are built, will greatly increase the above amount; and when the Nickle Plate spur is run to Marmont, giving a direct line from Chicago to New York other ice companies will surely locate here and carry on a tremendous business. 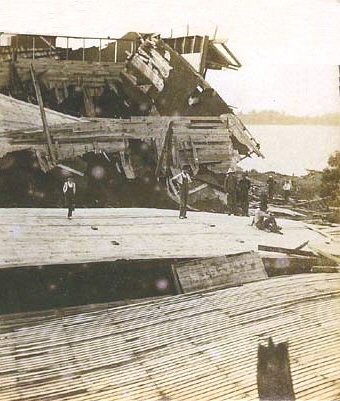 Above: images of the Ice House after a severe windstorm, possibly the "big wind" of 1913 that also severely damaged the lighthouse in Vandalia Park. (The ones he missed fell on the ground.) The Medbourns only found only one man who could do this job with real skill. That man was Buster French. Legend says that French was a little over-fond of liquor, but that when he was sober, he was the best worker in the business. Sometimes the other pullers would each let a block or two go by, just to see what Buster would do. They say Buster swore a blue streak when this happened, but he never missed a block of ice. Above: The March 24, 1943 Culver Citizen reports on the fire that destoryed the Medbourn ice house on East Jefferson Street. When the house was being filled, a man (called a "puller") stood in front of the lowest door into each room. His job was to use a pike-pole to pull ice from the conveyor belt onto a slide which led into his room. When the lowest level in all of the rooms had been filled, the belt was lifted so that it would pass in front of the second level doors, and the process began again. Since there were eight pullers, the first man was expected to pull in every ninth block, the second man every eighth, and so on. This meant that, in theory, only one block out of every eight would stay on the conveyer long enough to get to the last man in line. In practice, however, things didn’t always work out so well, and the last puller sometimes had to work pretty fast to gel in every block. Above: Picturing the ice harvest. 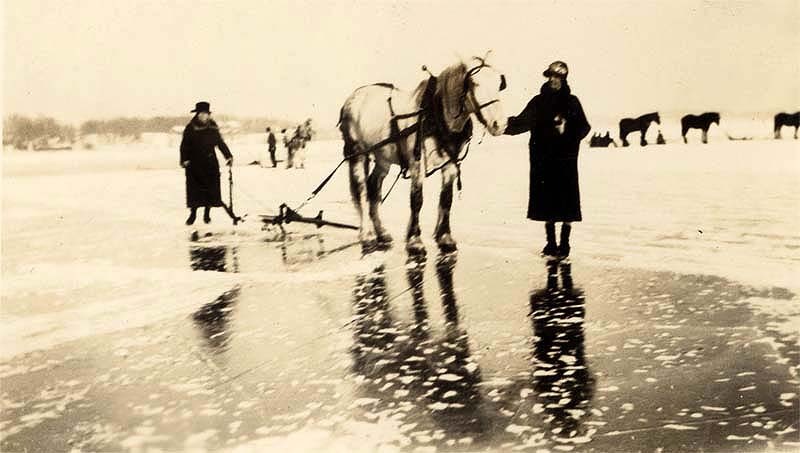 From left, ice was first scored by an ice plow, a set of spikes a little bit like a harrow, which left grooves about a foot and a half apart behind them as they were pulled across the ice by horses (photos 1 and 2). 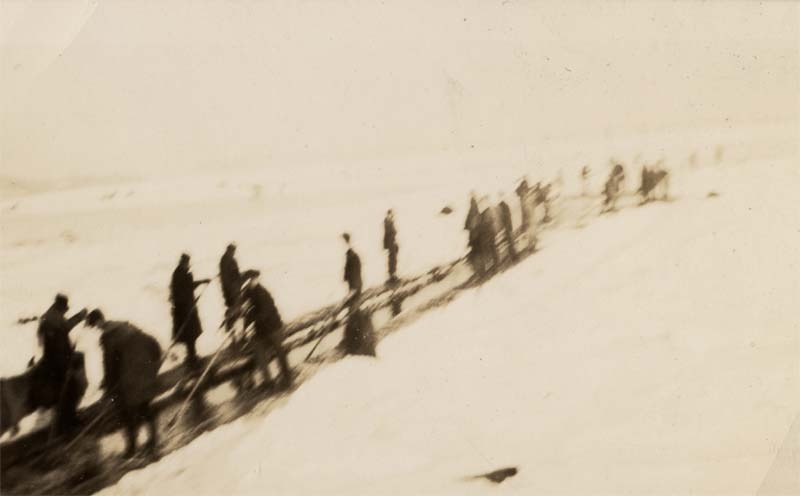 Men standing on planks put over the channel like bridges used pike-poles to break the ice into sets of squares small enough to fit into the next part of the channel (photos 3 and 4). 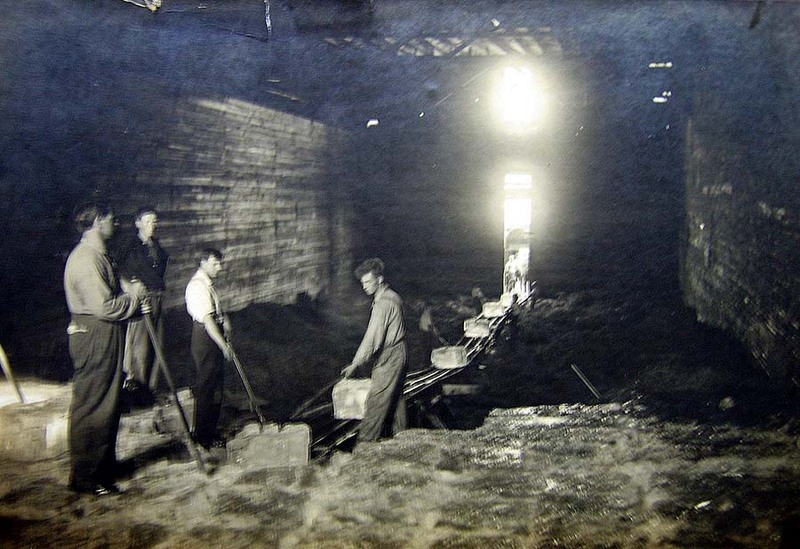 The ice was brought into the cement channel where it was broken into smaller blocks which were then pushed on the conveyor (picture 5). 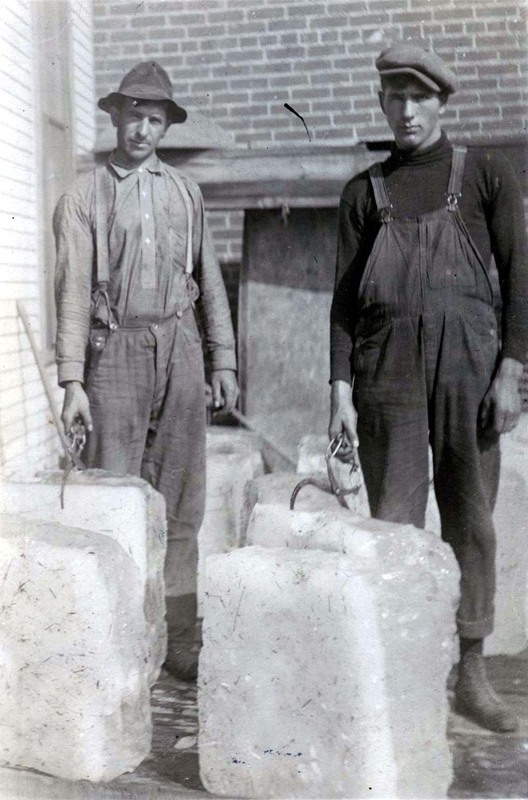 Two workers (picture 6) standing by two examples of cut ice blocks (picture 7). 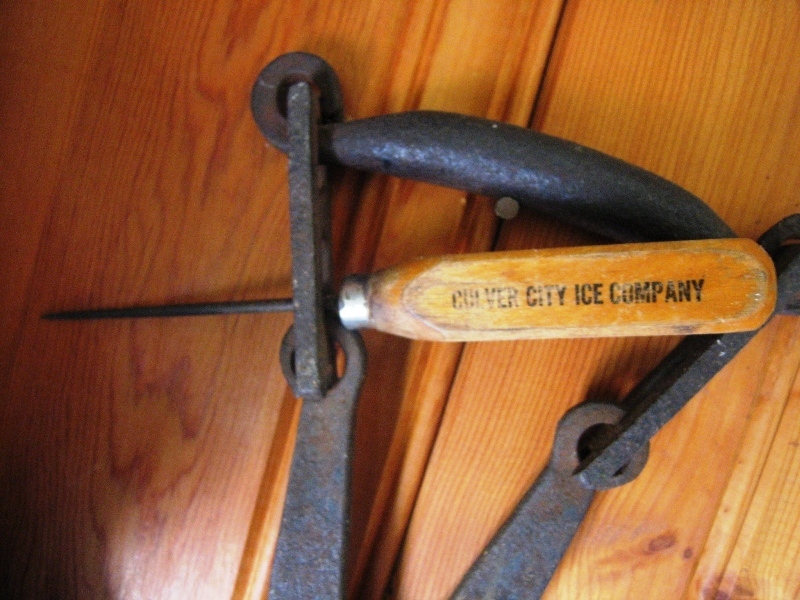 Two shots of ice harvest equipment from the Sherrill Fujimurra collection: (left) an ice pick from the Culver City Ice Co., and (right) the pick and tongs used by workers to lift and carry blocks of ice. Above: Two images from 1922 Plat maps show the location of the ice houses on the lake. 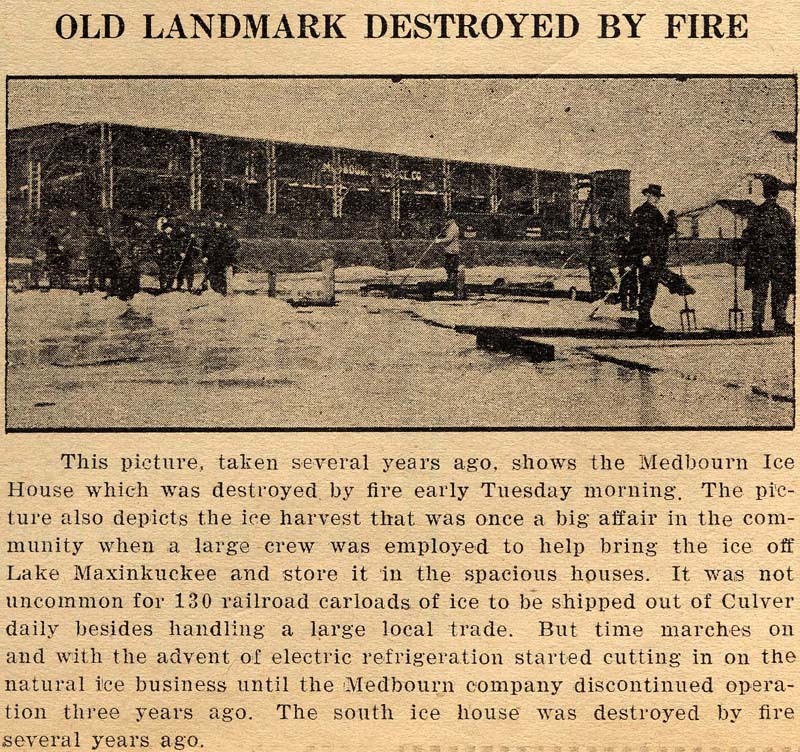 Medbourn estimates that the two houses together held nearly half a million tons of ice. Some of this was sold in Culver, some from the Medbourn Company's retail outlets in South Bend, Mishawaka and Logansport. The remainder was sent out by the railroad to other cities in Indiana and even to other states, especially those in the south. 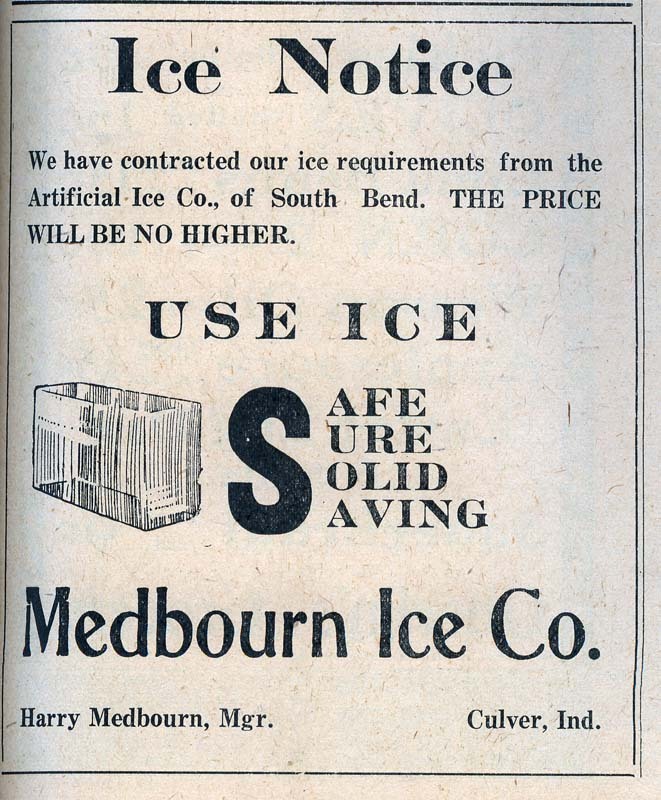 Culver’s ice age ended in 1934, when the Medbourn Company closed up. One of the ice houses was blown down, they say, in a windstorm; the other was used (or so I’m told) for the storage of vegetables, and burned down one year when it was full of onions…I’m not sure whether or not that’s true, but it’s a nice story. These and the following several photos are from the Donna Edgington collection, courtesy Sherrill Fujimerra. 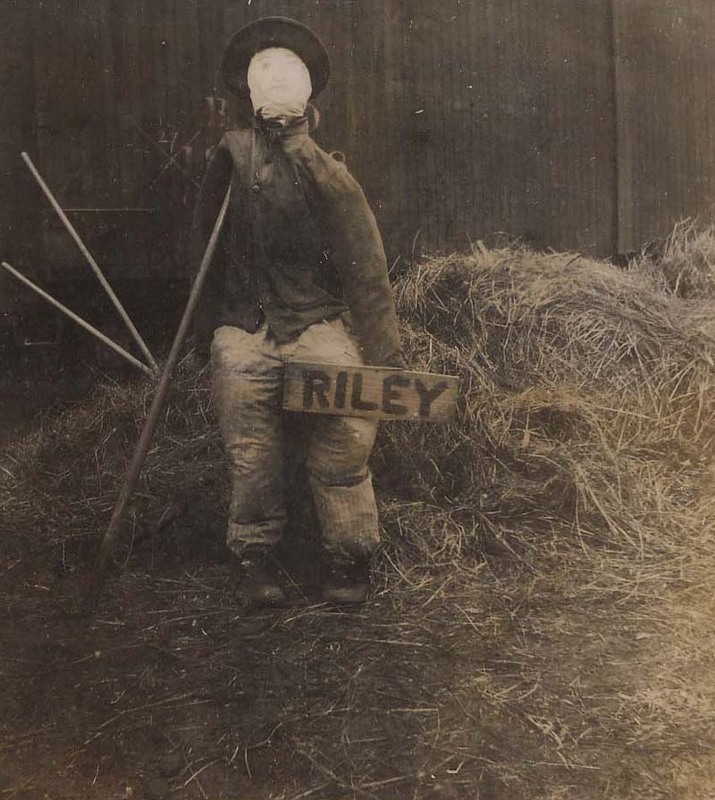 Depicted is "Riley," the scarecrow "mascot" of the Medbourn ice house on East Jefferson Street (near the present location of the Culver Cove). 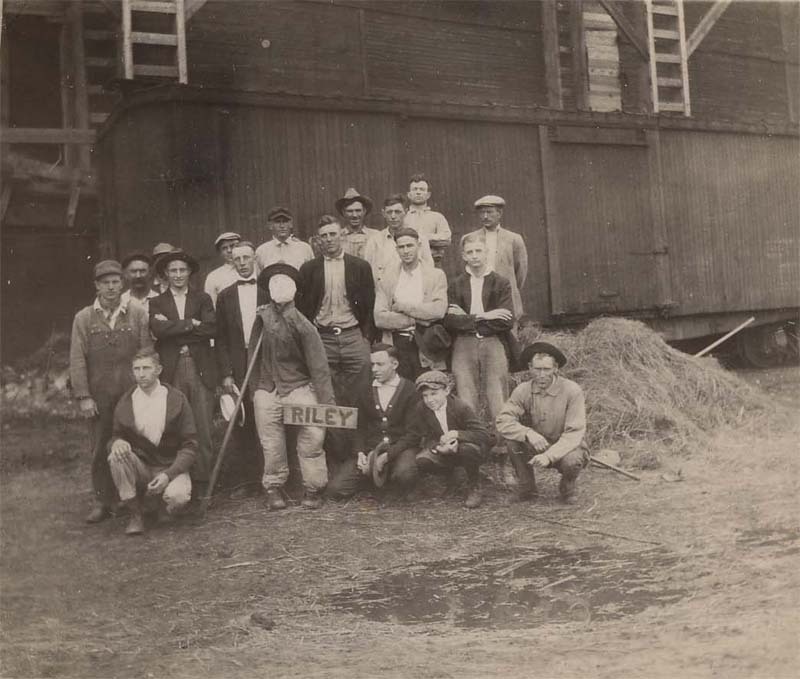 From the Donna Edgington collection, courtesy Sherrill Fujimerra, photos of the crew of the Medbourn ice house, taken in the 1930s ("Riley" the mascot is visible as well!). 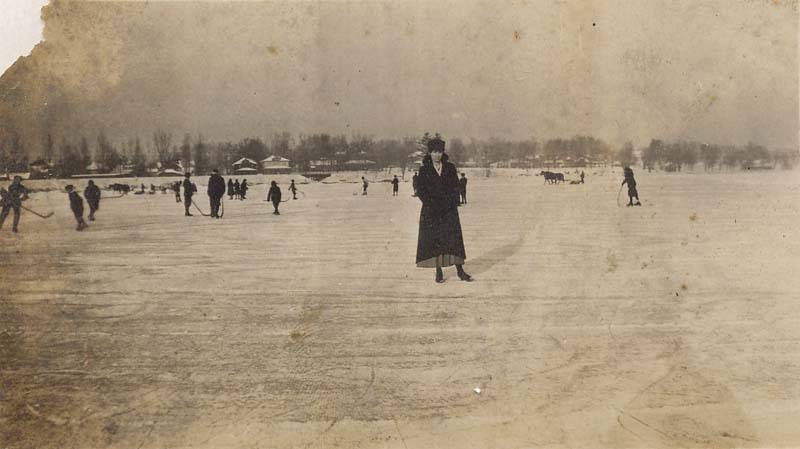 Several shots of the Medbourn family and ice house crew, skating and walking on Lake Maxinkuckee near the Medbourn ice house on East Jefferson Street in Culver. From the Donna Edgington collection, courtesy Sherrill Fujimerra. See also: Mark Roeder's writing on the history of Ice Houses in Culver (from "A History of Culver and Lake Maxinkuckee") here and Judi Burns' website on Culver's Ice Houses here. When I began this column of anecdotal history in September of `74, I intended to write about how things had been in the "good old days"; I never expected the Citizen to become a thing of the past. But now I have the job of writing the weekly Citizen's obituary. The Citizen entered the world as the Marmont Herald on an auspicious day -- Friday the 13th, July, 1894. George A. Nearpass founded the paper, having come to Marmont from Bremen. ; according to "One Township's Yesterdays," Nearpass was looking for opportunities in Argos when he heard that Marmont might be able to support a newspaper. He took the Nickel Plate Railroad to Hibbard, then walked to Marmont, where he convinced John Osborn, Sam Medbourn, E.B. Vanschoiack and many others to bankroll the venture. They raised the money and he moved his press to an old photograph gallery just across the street from the Citizen's present office. Nearpass helped change the village's name to Culver City in 1895 and sold the Culver Herald to J.H. Koontz on April 27, 1903. Koontz changed the newspaper's name to the Culver Citizen and sold it less than three years after he bought it to Arthur B. Holt of Kankakee, Ill., on April 1, 1906. Holt owned the Citizen during Culver's days of glory, writing wry and homely articles about the growing resort town. Holt sold the paper to two young and aspiring journalists, M.R. Robinson and F.C. Leitnaker on July 1, 1923. Leitnaker and Robinson worked together for three years. On Armistice Day, 1926, however, Robinson became sole owner. Robinson owned the Citizen for 23 years, longer than anyone else. During his tenure, the paper became a 16-page tabloid with seven 22-inch columns on the page and won both state and national prizes for reporting and editorials. In February, 1949, Robinson sold the Citizen to Major (now Colonel) Charles Maull, who employed Robert Rust as editor. 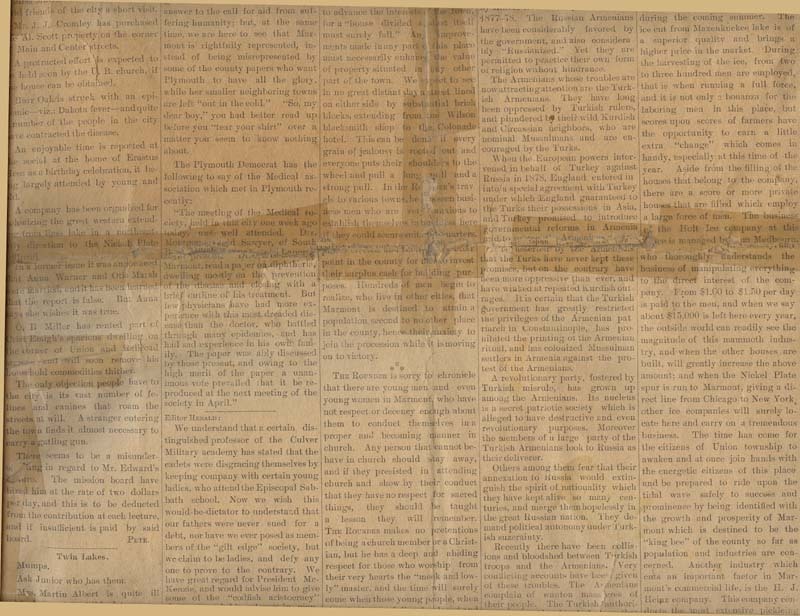 In May 1950, Rust leased the paper from Maull and served as publisher and editor until June 16, 1953 when he conveyed the Citizen to "Chet" Cleveland, a native of Plymouth who had returned to Marshall County. The Clevelands' Culver Press, Inc., published the paper until it became part of the Indiana Press of Plymouth in 1967. Exactly 41 years to the day after Robinson acquired the paper, it was sold to the Independent-News Co. of Walkerton, whose publisher Robert E. Urbin assumed editorship. Those were hard days for the Citizen -- it was often only a smeared four-page tabloid. In May 1974, however, the newspaper got a new lese on life when Tom and Bernadette Zoss assumed control. Under their enthusiastic leadership, the Citizen acquired new computerized equipment, an increased circulation, new features, including Bob Kyle's "Lake Water" and this column, and a new "clean" image. In September 1974 the Zosses moved to Bloomington and Nixon Newspapers Inc. acquired the Citizen. The Nixon chain has maintained the high quality of the Zoss's paper until the bitter end. The Herald/Citizen has been a part of the Culver community for more than half its life; at its best it was a leader in the town's affairs and even at its worst it held us together by providing something for us to complain about. What more could we ask? Our interview with John Houghton about Culver in his latest book, "Rough Magicke." A sample chapter from his latest book, "Rough Magicke."